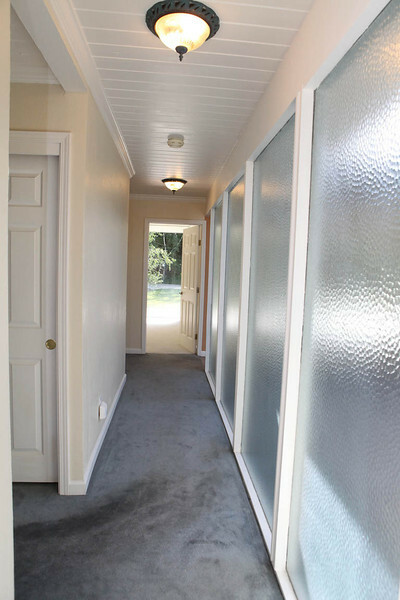 Can’t say that we miss the carpet, the crown molding, tan paint, nor the “interesting” ceiling lights. Nearly all of that went straight to the dumpster within the first 24 hours we moved in. 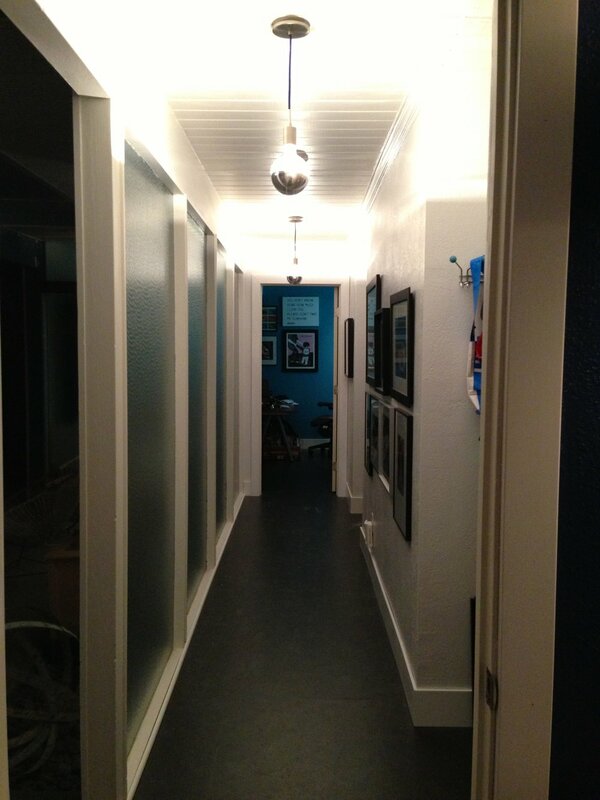 At the time (we’re talking almost six years ago), we were on a budget and getting new replacement globes wasn’t really an option, so we went with these more urban/modern style pendants with the colored cord, which were at an affordable price point. Really, ANYTHING was better than the Home Depot specials that were there before, so back then, we were quite happy with the new lighting replacements. Fast forward a few years, and we realized that the pendants just didn’t feel right in the space, plus we have a lot of tall friends and they would tend to nearly hit their heads when walking down the hall! Being in the design business, I started to discover a bunch of great options for newly designed/manufactured Globe Lights. Not sure how, but I stumbled upon the site Dutton Brown. If you haven’t heard of them, check them out! They have so many fabulous midcentury modern styles and check out all their cool powder coated color options on all their products. We love that they are an American company, and their styles are made-to-order in Minneapolis. 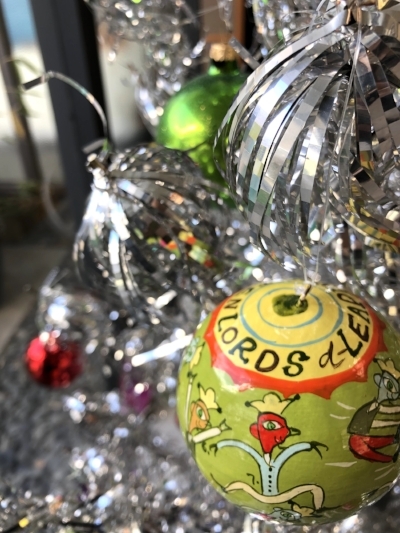 We ordered the Cap Flush Mount 8” Globes right around the holidays and they arrived fairly quickly, though it took us another few weeks to finally get them up! So here are our fabulous new globe lights, which actually look similar to original ones found in Eichlers and other midcentury modern homes. We love them so much! And PS, this wasn’t a sponsored post - we just really do love our new globe lights AND that we discovered this great source for midcentury modern lighting! Unfortunately John and I get really sneezy around beautiful real Christmas Trees, so for the past years we have had a fake White Tree. Well after a few years, our (obviously not very high quality) white tree eventually started to turn brown, not able to sustain the warm summers stored in the shed (or perhaps it was just crappy and would have turned brown anyway). 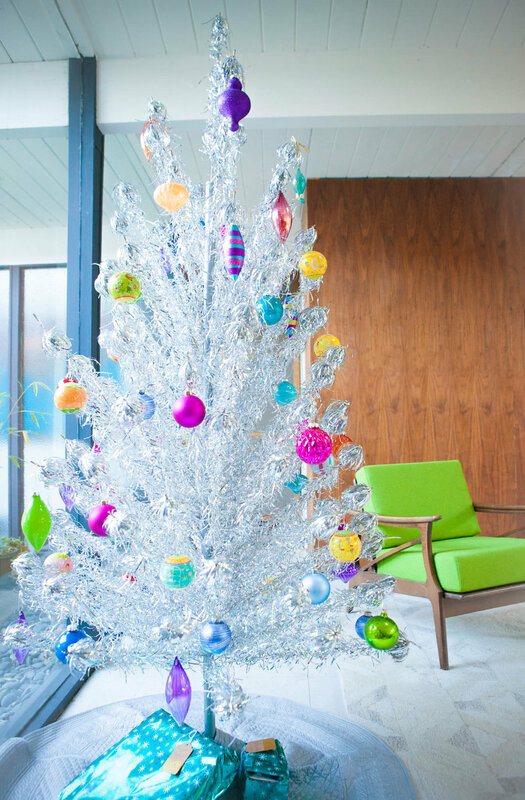 I started researching aluminum trees, inspired by so many of you MCM enthusiasts out there that already own one. 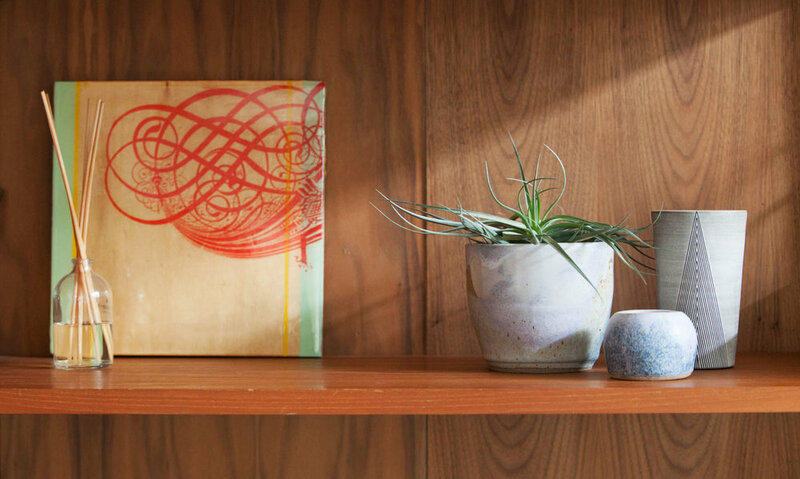 They look so wonderful and at home in a mid-century home. So began my quest around Thanksgiving to find one. I didn’t realize that there were quite a number of different brands, sizes, and branch count! I gave my first try at an eBay auction and won my first item! I was relieved that it arrived intact and with all 110 branches accounted for. The tree is from the United States Silver Tree Company (Scranton, PA). We love that it came in its original box, with each branch carefully stored in individual, original paper packages. How we are going to maintain this meticulous putting away of the tree branches each year in each paper baggie I am not quite sure …. but you can definitely tell how well cared for our tree was! Each branch is made from Reynolds Aluminum and hence the note: “SAFE FIREPROOF” - so cool! In place of an original Color Wheel, we opted for a new LED colored light to shine onto the tree. The kids love the different colors and that it’s operated by remote. Vintage, yet modern technology! So you will find us here in our living room for the rest of the holiday season; lights dimmed, admiring our sparkly metal tree (and kids fighting over what color to change to next). The lights reflect a nice Aurora Borealis effect on the ceiling, which is also fun! We are SO fortunate to have the most amazing friends! (That is an understatement and we really mean it). 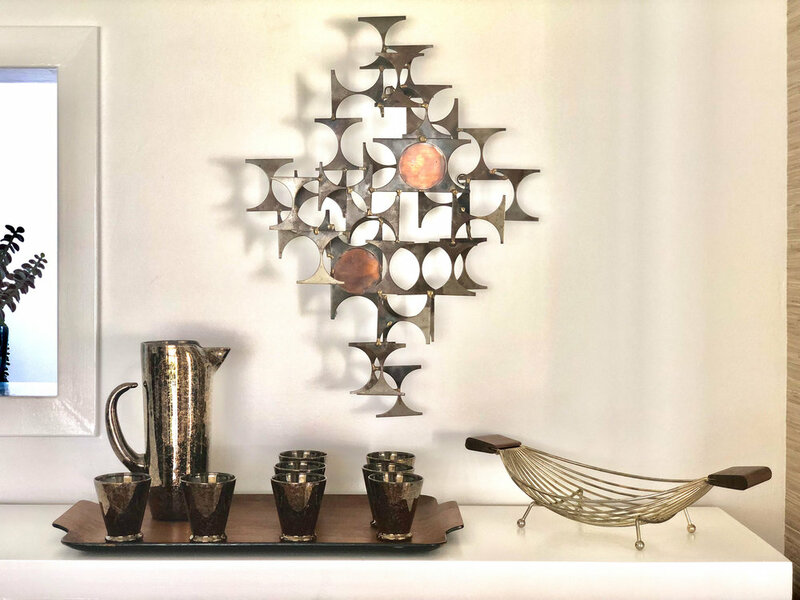 Over the years living in our Eichler home, we have have had a number of very generous friends simply “gift” us with vintage mid-century pieces they no longer needed or had room for. From a set of Danish style seating, to a dresser, to chinoiserie lamps, each piece has been given to us by different folks saying essentially the same thing: they know that the pieces will be well-loved and given an extended life in our home. Well, these friends are 110% right (and so nice!) Their gifted pieces bring us so much joy AND we are so happy to give them a second (or third) life. So here we are, recently “gifted” another special vintage item (shoutout to K & S for their generosity!) that we have always coveted: a Danish teak wall unit shelving system (that seems really similar to the original Poul Cadovius designed Royal Systems found online, but this one doesn’t have any markings, except it is made in Denmark). A few weeks ago, we finally got around to installing it, even though it sat in this room for nearly the entire summer. It took a Sunday afternoon and evening, but we were able to piece together all the shelves and metal brackets to fit the Wall Unit along our walnut-paneled wall. Why did we wait so long to put it together?! IT. IS. AMAZING. We did some rearranging to accommodate the new wall unit and it has it really transformed the space. Not to mention it has given me something fun to do, which is to obsessively re-style the shelves on the daily. Our Danish Credenza found a new spot along the Eichler Siding Wall. This gave me a chance to re-arranged this area a bit too, simplifying the gallery wall. Some of my thrifted/vintage finds and our Palm Springs Artwork along the Siding wall. Now the kids have a place for their computer homework/YouTube viewing (in full view of Mom and Dad in the adjacent kitchen, which is key). We have a home for all the “chotchkies” that John doesn’t especially care for and (and I collect and cherish), which can be swapped out and re-styled on a whim. My SIL’s awesome pottery and my favorite tumbler. One our favorite parts of the design is the angled shelf, where our MCM Coffee table books can have a proper display. The detailed craftsmanship of the shelves and brackets are so meticulously designed. My first SLR camera, my Dad’s Minolta XD11. This week, our family took a few days to spend some one-on-one time with each other before summer officially ends and school schedule starts up for the kiddos. While I left John back home with the youngest to chillax at home (and string a couple of Acapulco Chairs), our oldest son and I hopped in the car and did a super quick visit down the coast to spend time with friends in San Luis Obispo. During our short stay in SLO (as they call it), we popped by our friend Jenny's amazing mid-century modern home. As many of our friendships have begun, we first got to know Jenny through her beautiful Instagram Feed and then eventually met in person a few years ago while we were all in Palm Springs. I hadn't ever been in her home until now, (which made this spontaneous trip EVEN better!) so I was beyond excited to finally hang out with her and her family in their cool house. We pulled up to their home and I knew right away we were in the right place. They created the beautiful landscape divider piece. Swoon! (And of course re-did all this awesome landscaping themselves). While waiting on the front doorstep, Sebastian was already admiring their cool MCM mailbox. I was equally obsessed with the front door and hardware... and door bell (of course). Door opens, kids took one look at one another, then proceed to play for the next few hours. Mid-century modern family match made in heaven! (And wow, when my kids aren't together and fighting, life is SO different). Jenny sure knows how to make a kick-@ss Shelfie. 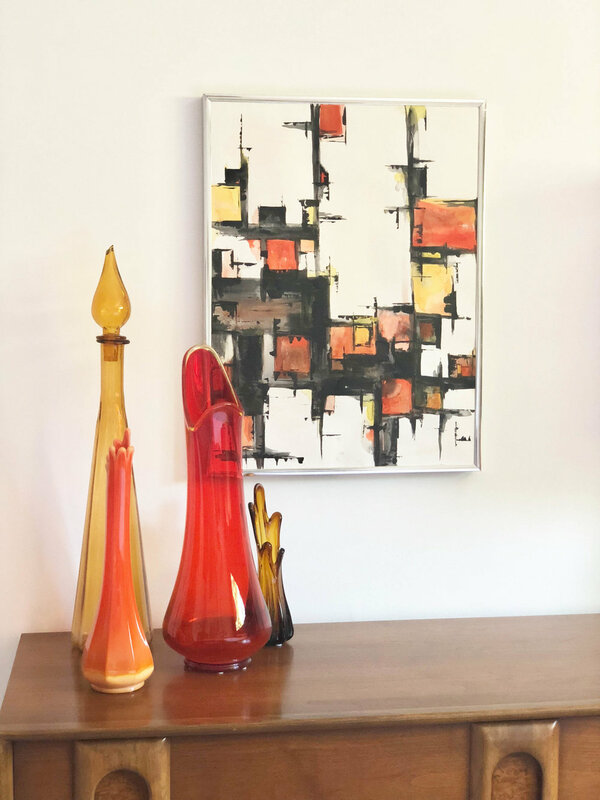 Jenny created so many vibrant paintings throughout their home .... with perfect accessories. The teeniest, most adorable kids dresser/vanity set I have ever seen. Love this spot they created in the back yard. Two DIY'er-mid-century modern nut/enthusiasts Mamas enjoying a summer morning chatting it up. If you don't already follow Jenny's IG or Blog go there now. You are welcome. Her and her husband are always working on some crazy creative project, whether planting ginormous agaves or building cool bookcases, AND they are the nicest family ever! We have two Acapulco chairs, classic mid-century modern outdoor furniture originally made in Mexico in the 1950's, which are perfect for patio or poolside lounging. Our chairs started to fizzle out this year after three years in the crazy California heat, so instead of buying new ones we decided to find some fresh vinyl cord and give it a go. The two chairs we had were different: The black frame chair was an original we bought from an Eichler neighbor, who had already had the chair rewrapped; the white frame chair was a knockoff from a local discount outlet, which was noticeably inferior in comfort and restoration effort. I purchased the PVC vinyl cordage via Etsy from InnitDesigns, a company based in Canada. I reached out the vendor with pictures of my chairs and they recommended two bundles of 135' 0.2" cord. All in for two chairs, four rolls plus shipping, ran us $84. The fresh vinyl cordage was soft like taffy. I found that the key to a good wrap is keeping the cordage evenly distributed on the outside frame, while keeping the ratio just right to keep the strands perfectly even on the inside hole. The cordage should wind evenly around the center ring. The number of winds in between runs to the center ring will change anywhere from seven to twelve. You need to eyeball it to see that the cord runs straight out to the outside frame. I didn't find a good way to calculate it precisely, especially my first time. You cannot just tell yourself 'seven wraps between runs'. As you finish one color, you take a couple inches of the new cord and wrap the lead against the frame, then cut the cord you are phasing out. The new cord that should be wrapped under the previous cord will be held tightly as you begin to wrap the end of the old cord, keeping it tucked under the metal frame to hide a subtle bulge you'll create. It took about 20 mins to remove the old cord, and about 2 hours to wrap the new cord. It was manufactured using cord about half as thick, and the frame had a center ring about twice as wide, so it allowed for smaller spacing between runs to the center. The new thicker cord I bought wasn't going to fill the center ring evenly and leave enough cord to finish the chair, so I sacrificed a perfectly finished look. 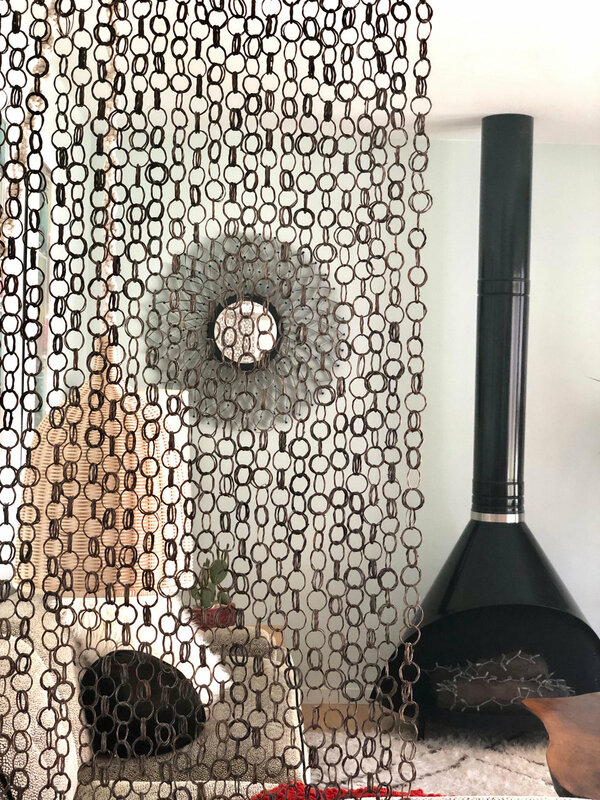 The frame had a lot of additional bracing welded around the center ring, so it was impossible to string the cord bundle through the openings to fill the center ring evenly. While removing the old cordage, I noticed that each run to the center ring was a separate piece of cord so the assembly technique was completely different in order to wrap it evenly. This is the remaining cordage left over. The only tip I can lend thus far, is using a utility clip to hold the tension which allows you to free up both hands to wrap the cord around. My hands were pretty dry and sore, so I reapplied lotion several times. The best video I found online was the one below. I'm sure I missed a lot of good tips, as a non-Spanish speaker, but it'll give you a the best view of what's going on. 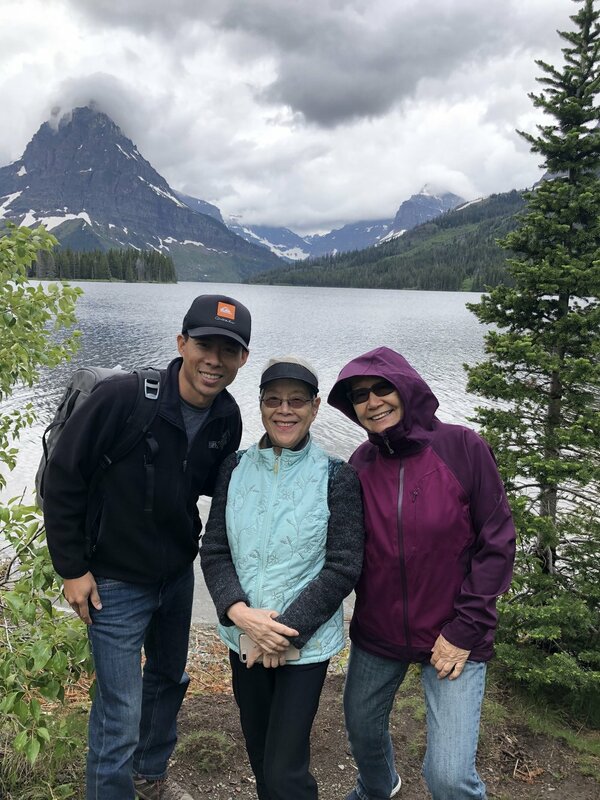 A week at Glacier National Park was the idea to kick off our summer with the family. Here's a quick rundown of how we enjoyed a week unplugged. Rented the trusty Dodge Minivan (yeah, the one with the remote doors and start!) We found an amazing AirBnb, a newly built custom home with fantastic views. View of the back yard. Our house was west of the Glacier Park, and the road through the middle was still closed, so we had a 2 hr drive to get over to the east side. 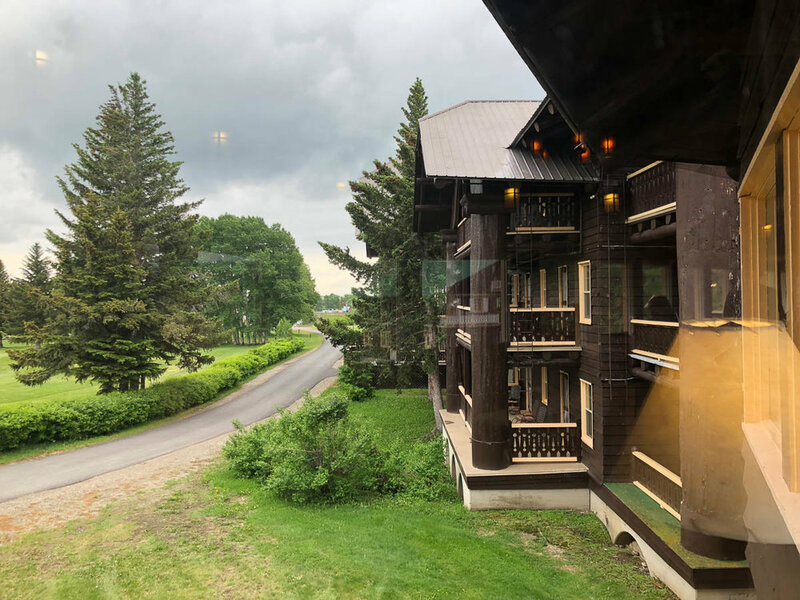 We stopped off as we entered the east side of the park at Glacier Park Lodge, a beautiful log-style structure. 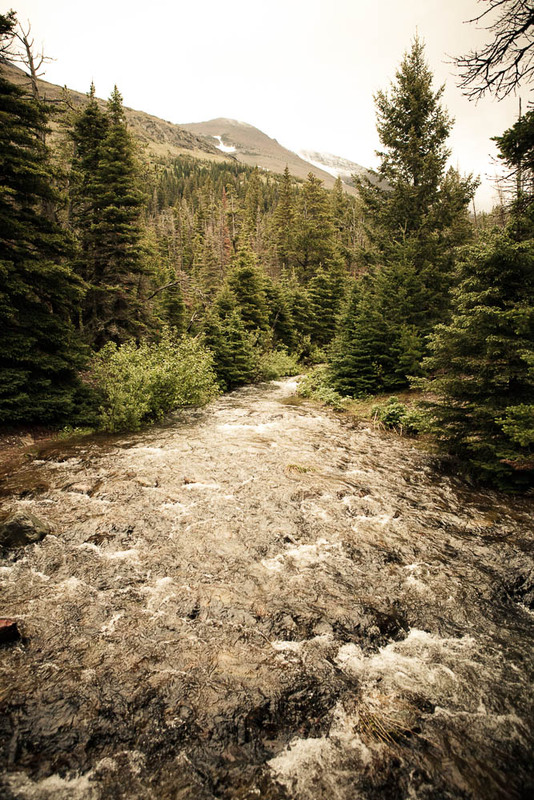 The hike starts at Two Medicine Lake, where there is a fully supplied cafe/store to stock up on everything from hot chocolate to fishing gear. 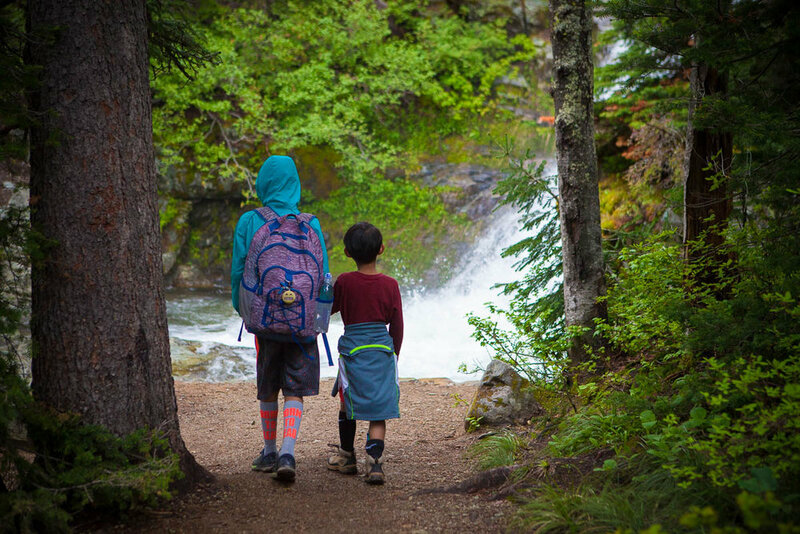 We took the 2 mile hike to the falls and the grandmas needed to turn back, but the hike did continue that many hikers took. I'm going to assume it was somewhere exciting! Trout caught at Two Medicine Lake shoreline fishing on a plastic worm bottom-bounced. I found Norm at Flathead Lake Fishing Charters, who was the sweetest dude. The weather wasn't great, but he greeted us warmly with pastries and coffee at 9am. We didn't catch anything, but he offered a discount if we booked him in the future, which I definitely would. He has mentored other popular guides on the lake. After lunch we explored the nearby town, Big Fork, to stroll the farmer's market and do some light shopping. We started from the west side of Lake MacDonald (amazing) at Fish Creek Campground, which seemed like a pretty cool spot (would totally camp there). We fished there and saw a lots of folks kayaking from Apgar Village, another larger commercialized campground. 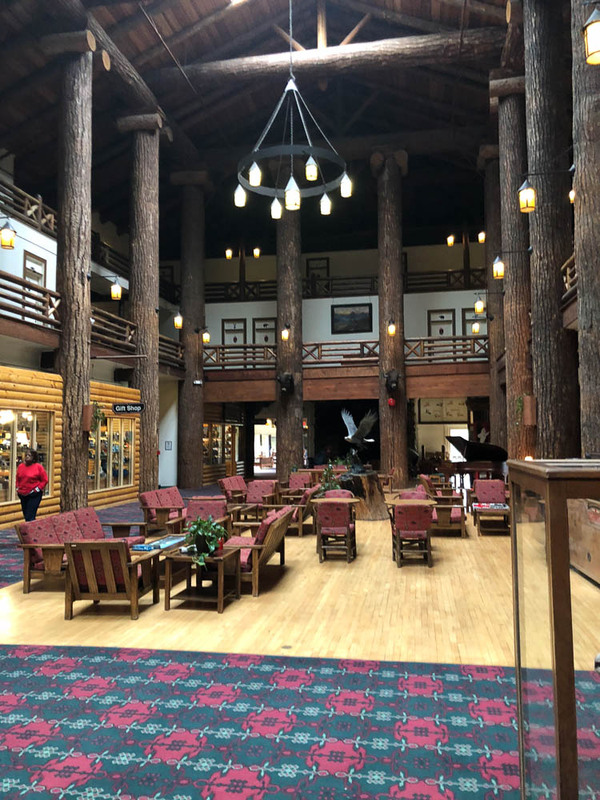 There are restaurants, supply shops, a ranger station where we stayed for a talk about the Pika, a relative of the rabbit, who has been affected by climate change, but the rangers aren't allowed to mention it on record - CRAZY - UGH!! Scooting up the road, we hit up the Lake MacDonald Lodge, which was a pretty big spot - hotel, restaurant, supply store. I'd hunker down here in as a lodging option in the future. In the late afternoon we headed back and stopped along the way to soak up the scenery - WOW! I haven't seen this type of view anywhere else. We had several locals tell us to spend a day at Bowman Lake, but the roads were so bad, our minivan didn't make it 2 miles before we had to turn back. That road is no joke! Improvising... we headed to Whitefish, a beautiful town filled with nice restaurants, cafes, a brewery, shopping, etc. It was good for a long lunch. Whitefish Lake was awesome - we spent the morning at Whitefish Lake State Park to let the kids swim. There was a dock, swimming area, and a small rental shop. 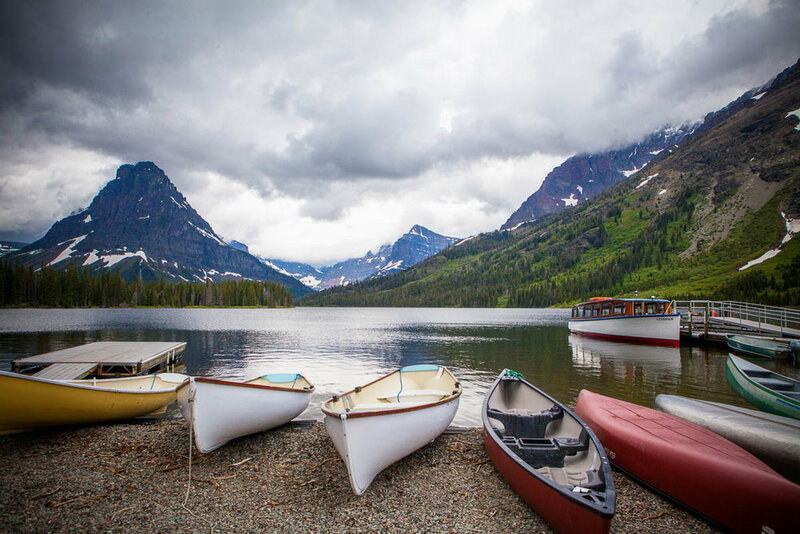 Day 6: Grinnell Glacier Hike: When in Glacier Park, right? Just before got to Many Glacier Hotel, we stopped off to appoint a pair of Jr. Rangers at the St. Mary's Ranger station. 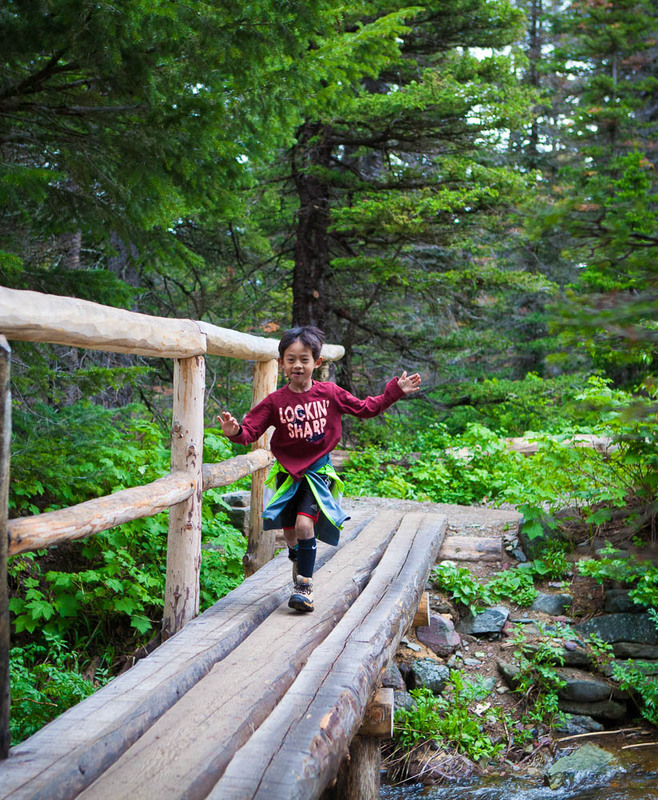 We wanted to see a glacier, but the only way is to hike or take a heli... or by car, you would need to head to Banff. Needless to say, we didn't quite see it, but the experience was still amazing. The hike begins at the amazing Many Glacier Hotel which was majestically positioned within the mountains - reminded me of a Bond movie where he pulls up to some chalet in his Aston Martin. The hotel seemed awesome - had lunch and relaxed and hiked around the lake. The hike could've been the highlight of our trip, but the full trip to see the glacier was WAY to long for two kids and two grandmas, so we aborted, especially after seeing signs for bears ;) You make your way around two lakes (we made it around one, then turned back), then start the real portion of the hike. They offer two water shuttles that book up quickly. If they do, just walk! I'm definitely heading back to Glacier for this hike another day. Cheers to a great trip - we will be back! Diamond shaped tile from Fireclay Tile creates a bold geometric backdrop. Handpainted tile pattern featuring a custom colorway, from Fireclay Tile. Stacked subway tile from Heath Ceramics gives a pop to this bar area. 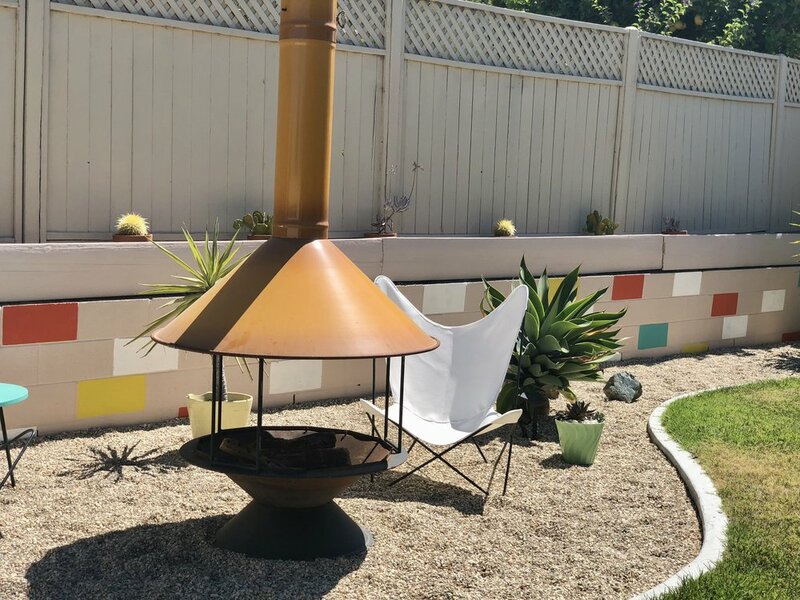 A custom pattern utilizing Heath Ceramics mural collection, in mid-century inspired color palette. Heath Ceramics Dimensional tile creates subtle pattern play. Diamond shaped tile from Fireclay Tile. 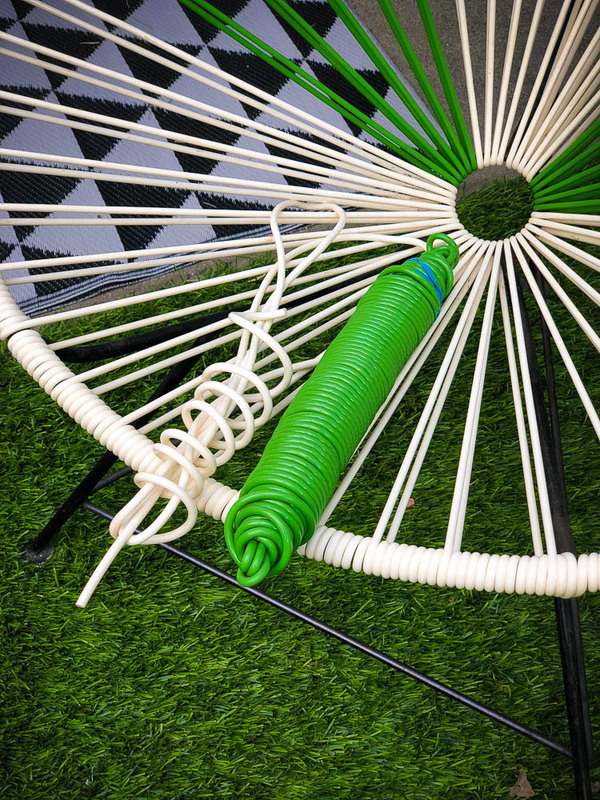 We alternated custom colors in an organic pattern to give playfulness to the space. Handpainted collection from Fireclay Tile in a Bar area. Last week, I was given the opportunity to go on a fantastic work-fun trip. A set of clients recently relocated to Phoenix, AZ, after living in the Bay Area for several years. I had the pleasure of helping them design their East Bay home, and after they sold it, they asked me to help with their next house renovation in Arizona. Of course I said, "Yes!" Coincidentally, my sister was also on a business trip there, so we were able to coincide our trips and mix in both work and enjoying all that the Scottsdale-Phoenix area has to offer, which I discovered is A LOT OF FUN and filled with mid-century modern architecture and inspiration. Fresh off the plane, my Client took me straight to Frank Lloyd Wright's Taliesin West. Architecture and FLW Fans will not be disappointed. The setting, nature and history behind this national historic landmark and creative "laboratory" is fascinating and absolutely spectacular in person. I had seen some photos before, but nothing beats experiencing the property and architecture/rooms in person. Light diffusion, sound, and nature and how they all interplay can all be witnessed throughout the property and tour. We spent the rest of my short trip enjoying local eats (due to allergies, I eat gluten-free, no dairy) and there were plenty of yummy spots to enjoy. My Client showed me the best vintage shopping (both mid-century focused and general thrifting) and I somehow was able to fill a small empty suitcase for the trip back to California! Here are some photos of Taliesin West and our incredible hotel Hotel Valley Ho, which for mid-century fans, is a must-stay! Talesin West Caberet Theater. I loved seeing the triangle and hexagon shaped inspiration throughout the spaces. My favorite shapesto incorporate into designs! On the grounds of the Talesin West property. Taliesin West, another beautiful reflection pool. Hotel Valley Ho's swanky Dining Room. I wanted to take home the Saarinen Chairs and Random Lights. Hotel Valley Ho's beautiful Lobby. Love the stone work that goes from inside to outside, seamlessly. Hotel Valley Ho. I love how the "balcony" continues through the glass an outside! Hotel Valley Ho. Yes it's always sunny in Scottsdale! Over the weekend, we had the pleasure of participating in Anthropologie's Summer Launch party at the Walnut Creek Anthropologie store. A few weeks ago, their Head Stylist (and dear friend of ours) Shannon asked us if we would be interested in helping them introduce the brand's Summer collection with a Sunday morning party. When she said Mimosas and coffee would be served, naturally we said yes. (Only (half) kidding). The store would be newly stocked with their Summer collection -- both furniture and home accessories and they invited us to talk about our design work and inspiration, plus introduce the new collection, which happened to feature a talented local artist. Taking Bridgette Thornton's beautiful work, paired with their other colorful products made the job of creating a "tablecape" fun and easy. I came into the store prior to the event to take a look at their new product line and was really inspired. This post, nor our participation in the event was not sponsored in any way, so I am totally truthful when I say how excited I was to view their home collection. Loads of color, pattern, texture ... all elements that are just the right flavor to layer into the type of work we do, which while it tends to be on the more modern/clean lines and minimalist side, we strive to create spaces that are still warm, and inviting. We were happy to meet the very talented Bridgette Thornton a local Bay Area Artist, who's playful watercolor designs are featured on Anthropologie's new outdoor tableware collection. I need to get our own set for going to our pool club this summer! The very talented and sweet Bridgette, showing her designs featured on tabletop and pillow collections. I gave a talk about Destination Eichler -- how we came about and what we do, then I got to "play" with Bridgette's new collection by pulling together a tablescape of her pieces and mixing in other products that I found interesting and colorful, along with beautiful Terrain greenery. Thank you to Shannon, Paige, Ryan and the Anthropologie team for inviting us to take part in this launch party! And big thanks to the friends/family (you know who you are) who lent moral support in the audience (and took iPhone footage), to the nice guests who listened in on my presentation and came by after to say hello, and a few clients who stopped by too. I haven't really done much/any public speaking since leaving my corporate job, (where I was used to giving updates at the monthly "Business Review" meetings and Quarterly full company presentations). Let's just say this was WAY more fun and I appreciated the guests interest and kind words for our work and business. Bridgette (right) with her beautiful collection, with me on the left. Cheers to Bridgette! We wish her continued success with her beautiful work and line. We met many delightful new folks we look forward to connecting with and enjoyed a peaceful kid-free Sunday morning. :) It was a good day and we're ready to jump into what the coming summer season has in store for us!